In addition to local Flat Screen TV installations we’re able to help you with many of your other audio/visual needs. Giving you a complete and seamless home theater experience. Subwoofers, TV Shelf Install, and much more. Any size and any Brand TV. TV Dismount & TV Swap . 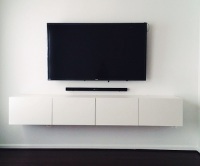 If you find yourself searching for " TV wall mounting services near me " from a reputable company in the Los Angeles area, look no further. As a locally owned and operated Professional TV installation and TV mounting company based in Long Beach, CA we’ve been proudly installing TV’s in homes and offices in the Los Angeles County area for over 15 years. We would love the opportunity to earn your business too. Satisfaction is Guaranteed! What Kind of TVs Can We Install? We’ve installed thousands of TVs in cities across Los Angeles County over the years - becoming one the most recommended TV Installation companies in the area. We’d like to provide you with the same quality and friendly service we’ve given our other loyal customers. To do this, we constantly expand our services and hone our skills to deliver the very best to our clients. Flat Screen TV Installations above fireplaces have become really popular as a space saving mechanism and a visually appealing option in Los Angeles County. Installing a TV Above a Fireplace? Since installing a Flat Screen TV above the fireplace can be risky this isnt the best time to start a DIY project. Left in the hands of an inexperienced individual your TV will ultimately become a safety (and fire) hazard. Instead hire reliable and experienced professionals who are capable of professionally installing your TV above the fireplace ensuring you’ll get the look you want. What Are Some Guarantees From Our TV Installation Services in Los Angeles? If you need your Flat Screen TV installed in the Los Angeles Area, get Professiona TV installers who are experienced, friendly and strive to meet our clients’ needs all the time, Every Time. Contact us today for a free quote or to book our service. If you’re unsure about what you’d need we’ll be more than happy to walk you through the process. ~Shirly W. Fountain Valley, Ca. TV Install in Lakewood, Ca. TV Installation in Culver City,Ca. Mounting TV in Walnut, Ca. TV Mounting in Montebello, Ca. TV Mount Service in Long Beach, Ca. TV Installs in Carson, Ca. TV Install in Covina, Ca. Mount TV in Norwalk, Ca. TV Mount Service in Glendora, Ca. TV Installers in La Mirada, Ca. TV Mount Service in Hawthorne, Ca. TV Install Service in Pico Rivera, Ca. TV Installers in Gardena, Ca. TV Installers in East Los Angeles, Ca. TV Installers in Artesia, Ca. TV Installers in Palos Verdes Estates, Ca..
TV Installers in Rancho Palos Verdes, Ca. TV Installers in Santa Fe Springs, Ca. TV Installers in Signal Hill, Ca..
TV Installers in South Gate, Ca.